As the winter settles in, we are warming our souls with an exuberant piano recital right in the heart of London, at St Martin-in-the-Fields. 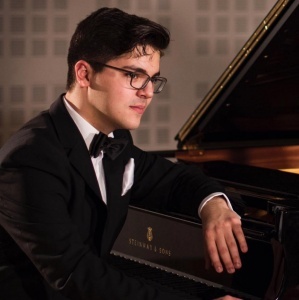 Romanian pianist Daniel Ropotă promises to lift our spirits with his striking ability, youthful flair and a spectacular programme that includes works by Lipatti, Shostakovich, Mendelssohn and Debussy. Daniel Ropotă is a Romanian pianist currently studying with professor Helen Krizos at the Royal Northern College of Music in Manchester. At the same RNCM he attended a masterclass, performing with the Manchester Camerata in 2017. He has already won a total of twenty-four prizes from prestigious piano competitions in Romania, Italy and Hungary. Making his debut as a soloist at the age of fifteen, Daniel has been playing with important philharmonic orchestras from Romania, the Republic of Moldova and England, having featured in solo and chamber music recitals in festivals such as The George Enescu Music Festival (Romania), The Chetham’s International Piano Summer School (UK) and Crescendo Summer Institute Festival (Hungary).